Having had only half of the rain we should have had by now, Dullstroom is in a bit of a green drought. 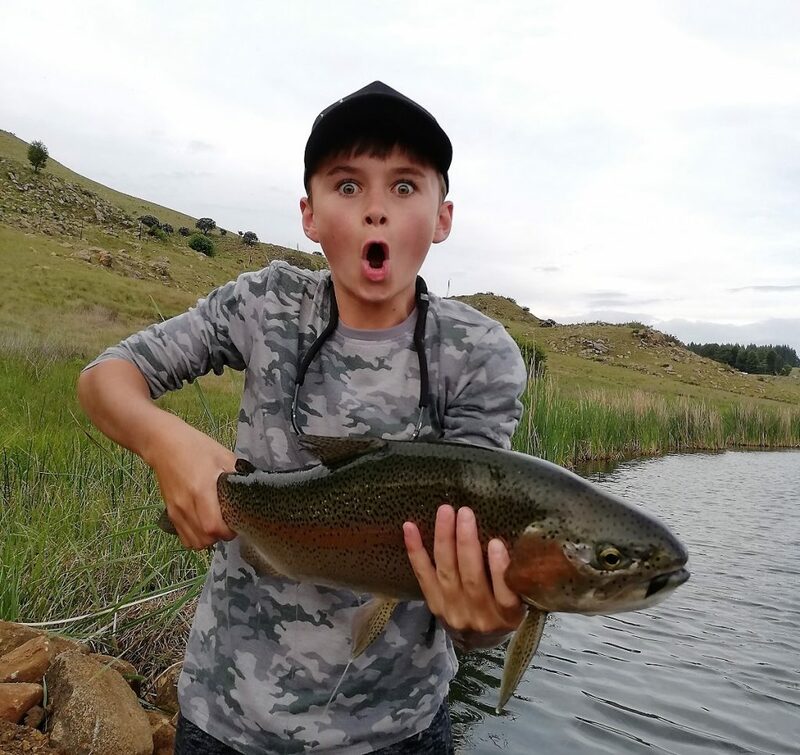 Dams lower than usual, coupled with long hot African days – our trout fishing is certainly not at its finest. Most dams are sitting on 22 degrees, making fish lethargic and uncomfortable. Most fish caught are long and slender, indicating that the fish are not prepared to move around looking for food, despite the waters teeming with baitfish, damsels, dragonfly nymphs and everything in between. Areas surrounding Dullstroom have received considerably more rain than what we have, making farms like Fancy Free see no shortage of water, in fact, most of their dams are overflowing. The main advantage of rain this time of year for trout is the fact that rain mixes up the water and adds oxygen to it. This then cools down the water, making trout more comfortable and willing to feed – aiding to the success of us fishermen. The fish that have been caught over the last month have for the most part been deep and slow. On some waters such as Laverpa, Walkersons and Santa; the evenings have produced rather well on dry, however, mornings were definitely the most productive time of day to be out on the water. Waking up at the rather ungodly hour of 4:30 doesn’t appeal to most, but the few anglers that were willing to be at the water’s edge at 5am were definitely rewarded; and I don’t see that changing for January. Silly season is over, the waters have had a chance to be rested from all the fishing pressure December always brings, making January a good time to hit the water as far as summer fishing goes. Fish deep, fish slow and make sure you observe what’s in the water, not just food source but also the colour and size of the dragons, damsels, tadpoles, etc. the aquatic life varies at each water, so improve your chances of hooking something by matching the hatch as closely as possible. Be on the water as early as possible, it’s a sacrifice worthwhile. In the early mornings fish will naturally be closer to the margins, start off by fishing floating line, long 12-16ft leaders with a dry and dropper or skinny damsel imitation. Emerger patterns such as klinkhammers and shuttlecocks ought to do the trick as well. As the sun gets higher change to an intermediate, and depending on how long you want to be out there, later change to a di3. Remember, rip and strip isn’t necessarily the best retrieve. If fish are lethargic they’re not going to readily chase prey, burning up the few calories they have left. Fish hard but fish smart. Observe your surroundings, what’s happening in the water and on top of the water. And be conscious of what you’re doing the whole time. 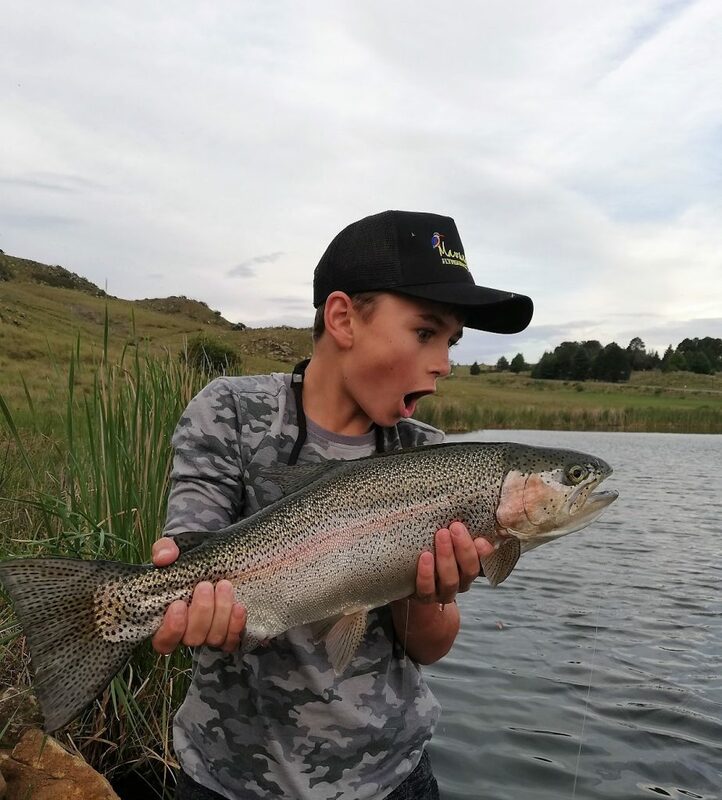 The best fisherman constantly question what they’re doing, what they can change – everything from fly, tippet diameter, retrieve, depth, and fish behaviour. With that said, make sure you’re stocked up on damsels, red eyed damsels, papa roaches in olive and brown, philoplume dragons in brown, olive and black, Zonkers in black, olive and grey and a few good old woolly buggers – all of the above in at least two sizes each. Apart from your wets, be sure to include a selection of nymphs. Beaded, non-beaded, brass beads and tungsten beads. Sizes 14-18. And lastly, a good selection of dries. Some bigger more buoyant dries to act as an indicator for your dropper, and some emerger patterns in sizes 14-18. Always make sure your leader is at least 9ft, if you’re fishing dry, up that to 12ft. and remember, the clearer the water the smaller the fly. Follow that advice and you’re sure to catch something!